Program 301 – Sacred Landscape | Wisdom of the Elders, Inc. Many Native people have carried the sometimes awkward and overwhelming expectation of mainstream society to represent not just their own tribe, but all Native Americans. There are over 500 tribes throughout the United States, each with their own distinctly rich histories, governments, languages, and traditions. When I was growing up in the sixties and even today, young Native women in their teens have expressed mixed feelings towards the daunting task of living up to the legend of Sacajawea. 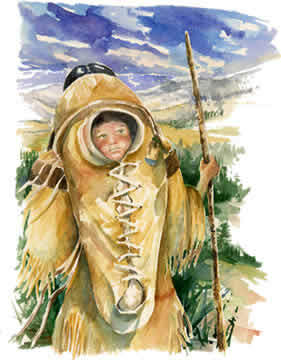 The knowledge and life skills that Sacajawea exhibited on the Lewis and Clark expedition were taught to all young Native women. These included identification and preparation of edible and medicinal plants; trapping and preparation of animals for food, clothing and other uses; and being resourceful and innovative in any given circumstance. Children were encouraged to develop their power of observation. Sacajawea’s personal history of being kidnapped and adopted into another tribe while still a child, called upon all her talent and wits just to survive. Given this experience, she sharpened her language skills, and her ability to size up the situation. 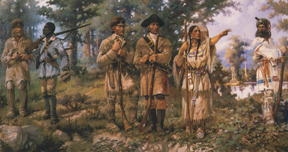 Being able to quickly assess situations over which she had little control and staying alert to danger, had been part of her daily life before ever meeting up with Lewis and Clark. Sacajawea embodied the values instilled in her by her family and community: generosity, courage, flexibility, commitment, respect, selflessness, honesty, diligence and humor. In traditional Native culture, these abilities and values, while extraordinary, were expected and necessary for the successful continuance of one’s community. These were the very traits that endeared Sacajawea to Lewis and Clark and made her so indispensable to the expedition, which had become a community itself. There are several stories as to what became of Sacajawea after the expedition. It’s believed that, like Pocahantas, she died in her twenties of an infectious disease introduced by the new Americans. And like Pocahantas, she also left behind a young child. Some believe she lived into old age. Young Native women today express new-found compassion for Sacajawea: kidnapped as a child, she was far from home, a teenage mom who’d been married off to an older, abusive man from another culture. With Lewis and Clark, she found herself in the company of more than 30 men, all foreigners to her and at least twice her age. She carried her infant son across rugged country, not knowing if she’d ever return home. Drawing on everything she’d been taught and had cultivated within herself in her short life, she rose to the occasion time and again to provide what was asked of her, and she did so with courage and grace. Her story is one of perseverance and survival, the unsung story of many Native Americans. No one really knows what Sacajawea looked like. Even so, her image appears on stamps and coins. There are said to be more statues erected to honor Sacajawea than any other woman in American history. She certainly deserves them, perhaps not so much for the legend, but on behalf of the strength of character and endurance of Native women everywhere. With each breath, with each step, with each heart beat. Osadadu.